Welcome to our growing Orchid family my newest beauty. She arrived with 2 beautiful spikes loaded with healthy blooms. 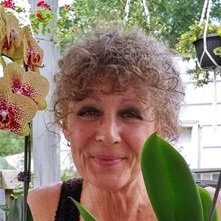 Unfortunately, I'm not happy, as always, with the potting media my new Orchids arrive in - broken down bark, sopping wet moss AND a million little weeds growing in all! YUCK!! !